Australia recalled top order batsman Phillip Hughes to replace the retired Ricky Ponting on Thursday for next week's first match in a three-test series against Sri Lanka. The 24-year-old, dropped last year as an opener amid questions over his technique, was named in the 12-man squad for the Hobart test with a strong indication that the top order will be reshuffled. "Phillip Hughes has been selected to fill the vacancy created by Ricky Ponting's retirement," head selector John Inverarity said in a news release. "Hughes, Usman Khawaja, Rob Quiney and Alex Doolan were the four batsmen to come under consideration to bat high in the order. "Phillip is an improved player and his recent and overall career statistics present a compelling case. 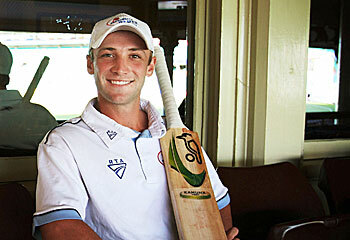 "The (selectors hold) the view that he, having just turned 24, is a very significant part of the future. He has received this call-up, his third, as it was considered to be the right time and circumstances for him to re-establish himself." With openers Ed Cowan and David Warner retaining their places in the side, Hughes looks most likely to bat at number three in the order with all-rounder Shane Watson moving down to replace Ponting at number four. Clarke, who currently bats at number five, also said after the Perth test he would consider moving up the order if coach Mickey Arthur asked him to. "Michael Clarke will give careful consideration to his batting order during the next few days," Inverarity said. "He has a number of options open to him and Hughes at three is one of these." Ponting played his 168th and final test earlier this week in Perth as Australia fell to a 309-run defeat to South Africa to lose the series 1-0. Left-arm quicks Mitchell Starc and Mitchell Johnson have retained their places in the squad after claiming all 10 South African wickets in the second innnings at Perth, albeit at the cost of 569 runs. Seamers Ben Hilfenhaus and Peter Siddle, rested for the third test against the Proteas after bowling themselves into the ground in the second test, are also recalled. Hobart has boasted an extremely lively wicket over the last couple of years but Clarke is still likely to leave one of the four quick bowlers out and retain spinner Nathan Lyon in the final side. Hughes played the last of his 17 tests in a loss to New Zealand in Hobart at the end of last year and will make his return to test cricket at the same Bellerive Oval next Friday. He has scored 1,072 test runs at an average of 34.58. Australia will also face Sri Lanka in the Boxing Day test at Melbourne and the New Year's test in Sydney. Squad: Michael Clarke (captain), David Warner, Ed Cowan, Phil Hughes, Shane Watson, Mike Hussey, Matthew Wade, Peter Siddle, Mitchell Johnson, Mitchell Starc, Ben Hilfenhaus, Nathan Lyon.